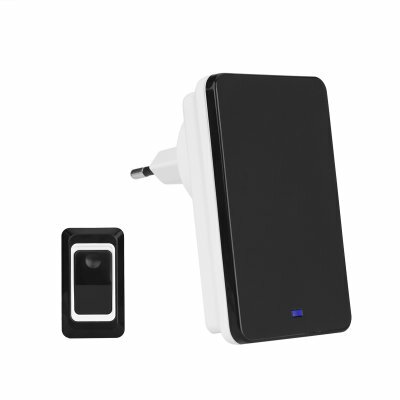 Successfully Added Wireless Doorbell - 3 Volume Modes, 28 Chimes, Up to 300 Meter Range to your Shopping Cart. This wireless compact doorbell is the popular way to know when someone is at your door. With a range of up to 300 meters, you can put the receiver in any room of the house and be altered when anyone pays you a visit. No more missing delivery men or guests when in the annex or out in the garage as this doorbell receiver can be set up throughout the home. Quick and easy to install you don't need to call out an electrician to bring your home into the 21st century. Plus there are no unsightly wires or fixtures that will leave marks behind. The sleek and futuristic doorbell is so compact that the transmitter runs purely on battery power. At under 40 grams, it can be slipped into your pocket and double as a personal assistance alarm for the elderly or those with disabilities. This affordable wireless doorbell comes with a 12 months warranty, brought to you by the leader in electronic devices as well as wholesale doorbells and home security systems..